We are the manufacturer's, representatives/Distributors of Ethernet Switches & Data Conversion. 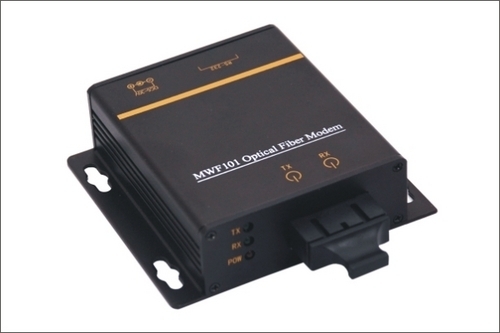 The MWF101 is convert RS232 signal to fiber optic signal, and the dependability, the security and the secret of the communications is much better than usual. It is widely used in industrial control and data gather areas,especially for electric automation system and traffic control department. Ÿ Industrial grade design , import component. The RS232/485/422 fiber optic modem can be used for transfer the RS232 or RS485 or RS422 signal by using fiber line. It could protracting the distance of communication and resisting the disturbing. It could security and the secret of the communications. The RS485/422 port support to multi-modes communications and is easy to construct the network. It is widely used in industrial control and data gather areas, especially for electric automation system and traffic control department. Ÿ Industry level designing, all surface adhibit technique. The MWF404 star network multi mode fiber optic hub is used to construct star fiber optic network ,transmit RS-232 and RS-485/422 signal to4 ways fiber optic star network at a high rate and protracting the distance of communications and resisting the disturbing.The dependability,security and secret of the communications is much better. The MWF501 is used to transmit the RS-232 or RS-485/422 signal by the fiber optic ring network at a high rate and protracting the distance of communications and resisting the disturbing, and the dependability, the security and the secret of the communications is much better than usual. Ÿ RS-232/RS-485/422 electric to optic convert, RS232/422 full duplex communication , R485 semi duplex communication . Ÿ Perfect serial port , optic port and power indicating lamp. Ÿ Avoiding loop voltage, surge . Induction lightning stroke, static electricity, and hot plug damage equipment . The MWE485-A can convert 3 wires (RX, TX, and GND) RS-232 serial port signal to semi duplex RS-485 signal. It uses technology of stealing current from serial port, no need external power supply. The MWE485-C can convert RS-232 serial port signal to two wires semi duplex RS-485 signal or four wires full duplex RS-422 signal. Ÿ Industry level design, excellent import element chosen, all surface adhibit techniques. The MWE485-D can convert RS-232 serial port signal to two wires semi duplex RS-485 signal or four wires full duplex RS-422 signalwith 2500V photo electricity isolation. It need a 5V DC power supply. The MWE485-HUB8 converter 1 Master RS-232/485/422 to 8 Slaves RS-232/RS-485/422 in high rate with full optic-isolation at both full-duplex or half-duplex models. It supports to long distance communications above 2km and multi-drops (8×128 nodes). This HUB used to extending the RS485 communication distance. It could converter the RS232 signal to RS485/422 signal. The MWE485-YG can amplify the RS-485/RS-422 signal in high rate and with a optical isolationand extend the RS-485/422 distance, resist the disturbing. Ÿ 15Kv static protecting and 600W/ms lightning protecting. Ÿ Automatically transmit full duplex or semi duplex. The MWE232-A achieves the isolation of RS-232 TX, RX, RTS, CTS, DTR, DSR and GND 7wires signals. It’s port-powered and doesn't need external power. Ÿ Industry level designing, excellent import element chosen, all surface adhibitting technique. Port powered. No need external power supply. The MWE232-B achieves the isolation of RS-232 TX, RX, GND 3wires signals. It is port-powered that no need external power supply. It’s also plus-and-play supported. The MWE810 could converter USB to RS232. Support IRQ,DMA or I/O. Ÿ Long-distance awoken and power manage. Ÿ Particular protect circuit of the port, static and lightning strike resisting. The MWE820B could converter USB to RS-232/RS-485/RS-422USB port powered. The MWE814 could converter 1 master USB to 4 slaves RS232. USB port powered. The MT8110 has one 10/100Base-TX and one 100Base-FX. It has 10M/100M self-adaption function, base on IEEE802.3/802.3u standard, it converter twisted-pair signal to fiber optic signal. Twisted-pair line port is RJ45, fiber optic line port could choose SC/FC. The communication distance is 520km. In addition to our switching regulators PSR-78xxLF and PSR1-78xxLF in a SIP3 case with 500 mA and 1000 mA we can now also offer a 500 mA switching regulator with an input of 4.5 – 28 V DC and output of 3.3 to 15 V DC in a SMD type case. - Operating temperature area of -40C to +85C (without additional cooling) are only some of the new key features of the PSR series. They are 100% Pin-to-Pin compatable with standard linear regulators. By: Eurotech Technologies Pvt. Ltd.